You might have noticed things have been a little quiet on The Boy's Behaviour recently. That's in part because Sarah at The Puffin Diaries and I have been working on a brand new website for those involved with adoption. Here's the press release that we sent out yesterday, and be sure to make a note to check out The Adoption Social when it launches on Friday 14 June. COMING SOON – The Adoption Social! A new blog to encourage and support those involved in adoption will launch on 14 June. Developed by two adoptive parent bloggers, The Adoption Social (www.theadoptionsocial.com) is a new site to support and encourage the use of social media as a tool for prospective adoptive parents, adoptive parents, adopted people and professionals involved too. Memory Box - A weekly blog link-up to celebrate great moments. This could be good parenting achievements, fab things your children do, good memories and could be text, poetry or even photos. The aim is to share positivity and achievement. Blogless Blogging – This section provides a space for anonymous posts from bloggers who don’t feel able to post on their own sites, one-off guest posts or those wishing to try their hand at blogging. Me & My Blog/My Twitter Life - Regular posts from others already using social media; sharing tips, advice and experience. 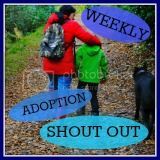 Adoption Social Connections – Tips on how to get started on Twitter, set up a blog, use other social media resources and also includes lists of useful contacts already on Twitter, Facebook and a blog roll. A Problem Shared – A spot where people can anonymously or not put forward a particular problem or issue, and others can comment or share experiences and advice. In time we also hope to launch twitter parties, include reviews of books, programmes and films, and hold a diary of events that might be of interest. “For me The Adoption Social is about providing support for those living within adoption, through creating social media connections. I’ve found that support myself and I want to share it with others who maybe feel sometimes that they are very much alone. We aim to reach out to these people and by sharing experiences and understanding we hope to create a social media community that can truly help.“ Added Sarah, from The Puffin Diaries, the other founder of The Adoption Social. It is hoped that adoption agencies, social workers, training providers and advocacy and support organisations will help promote The Adoption Social to their adoptive parents and prospective adoptive parents as a place they can access friendly support. More and more agencies are signing up to Twitter and Facebook and clearly are appreciating the types of connections they can build through such tools, The Adoption Social hopes to build on and develop those connections.